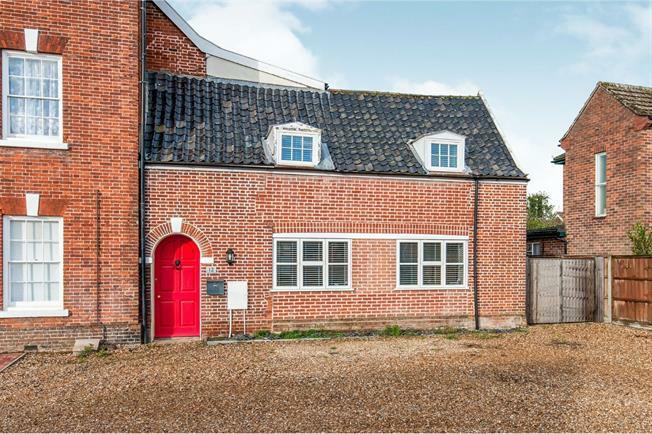 3 Bedroom Link Detached House For Sale in Thetford for Guide Price £230,000. The cottage is attached to the historic 'Harvey House', it should be viewed to fully appreciate its unique layout and spacious accommodation. The reception hall is well sized and leads to the open plan kitchen dining and living area. The double doors from the kitchen lead to the rear garden. There is a useful downstair w.c alongside an ensuite ground floor bedroom. Upstairs the two double bedrooms are serviced by a further bathroom. The finish inside is contemporary and has been well looked after. There is parking to the front of the cottage and it is well served by the proximity of the town and its amenities.